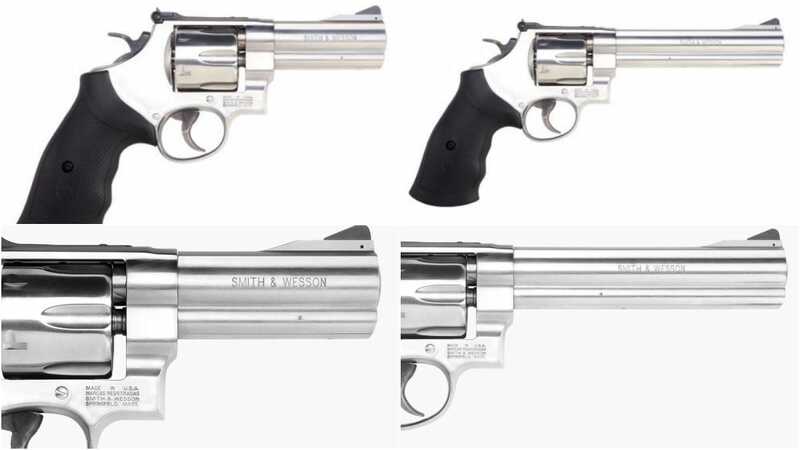 Smith & Wesson announced on Tuesday that their classic Model 610, capable of chambering both 10mm Auto and .40 S&W, will be returning to their catalog. The big stainless steel large N-Frame six-shooter is set to return to production the Spring. The company, in a nod to the cartridge’s recent embrace by a new generation of shooters, bills the 610 as having applications running from hunting to protection while venturing into the field in predator-heavy areas. First introduced in 1990, the model had a short initial run but has been a popular offering for competition shooters since then. Rebooted in 1998, the gun line closed again in 2005 but came back only briefly since then. The current offering includes guns in with both 4.5- and 6-inch barrels, which translate to a 9.5- and 12-inch overall length respectively. Weight on the Model 610 with a 4-inch barrel is a hefty 42.6-ounces, while the 6-inch barrel version runs 50. The DA/SA revolvers come standard with black synthetic finger groove grips, an adjustable rear sight with a white outline grips and an interchangeable black blade front sight. As both the 10mm and .40 S&W are rimless, the revolvers use six-shot moon clips, and three are included. MSRP is set at $969 across the board, which comes in about $150 cheaper than Ruger‘s Super Redhawk 10mm while being on-par with their GP100 Match Champion in the same caliber.